In the Italian region known as the “Cinque Terre” (“Five Lands”), uniqueness abounds. These fishing villages on the western coast of the province of Liguria were, until this century, approachable only by sea. Now, narrow roads with hairpin turns can be driven, white knuckled, to reach them. Starting form the Appenine Mountains inland, these hillsides descend precipitously until the final peaks hurl themselves into the Ligurian Sea. A few natural harbors are home to color-splashed towns carved right out of the rocks. Each is distinctive due to the varying shapes of the inlet they inhabit. Their beauty is best appreciated from the ocean; from the patchwork quilt of Manarola to the aching, singular wonder of Riomaggiore. Nestled directly behind them, rows of vines and olive trees rise straight up the mountainside. This is certainly back0breaking viticulture. Liguria produces the second smallest mount of wine of any Italian province. The Valle d’Aosta is last, but that mountainous region (formerly known as Savoy) bordering France and Switzerland is mostly pre-Alpine rock formation. Instead, Liguria has become such a desirable destination for Italians to spend the summer that more and more land, Italy’s most precious commodity, is turning into housing. The whites of Cinque Terre are perfumed but very dry, astringent, and tough. They beg for fish. The reds are amazingly grapey and fresh, rather Beaujolais-like. Their grace suits seafood as well. 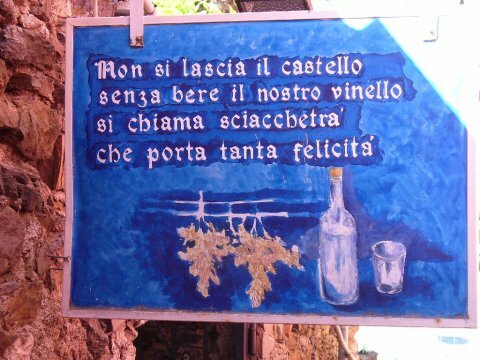 However, the prized wine of the area, a wine surrounded by mystery, superstition, and drama, is called Sciacchetrà (shah-keh-TRAH). The rules for how it is to be made have changed little over the years. It is a sweet dessert wine of at least 13.5% alcohol. 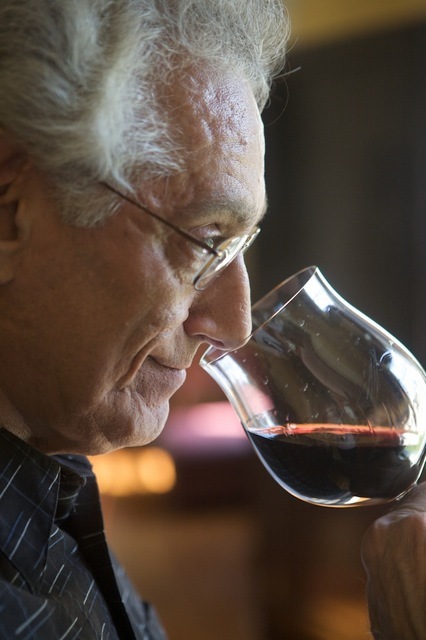 It is readily available at wine shops as a local specialty, but does this wine have anything to do with the legends of old? The grapes used are whites named vermentino, bosco, and albarola. I have in past columns mentioned what a unique bouquet and flavor the vermentino has, and I’m convinced it’s a big source of the excitement of this wine. The grapes are de-stemmed and mat-dried for a long period before being pressed. During fermentation, the more the yeast is allowed to consume the grape sugars, the drier the wine becomes. The must is then aged at least one year in small oak barrels. I tried three commercial bottlings purchased at a local wine shop. They were a 1998 Sassarini ($16.50); a 1997 La Cooperativa delle Cinque Terre ($22.50), and a 1996 Giumin di Arrigoni ($27.00). The Sassarini was the lightest both in color and texture. It was faintly sweet with nice acidity and a pleasant apricot overtone. The co-op wine may have been my favorite. It had a deep yellow color, higher alcohol, and more viscosity with a balance of nuttiness, sweetness, and lilt. The Giumin hinted at grander things: light gold, ample, deep bouquet, and a full flavor that unfortunately had some oxidation and funkiness. Maybe the vintage was troublesome, but it didn’t quite work. One day, a bright-eyed leprechaun disguised as a 78-year-old fisherman named Mauro showed up in front of our house with a gift. He said he was a good friend of my cousin. He gave me a tall bottle with a cork that looked like a worked-down Champagne stopper and a hand written label which was brief and to the point: Sciacchetrà 1994. I had read in older reference books that Sciacchetrà could age for decades and that its alcohol level was listed at 17%–unfortified. It had the same cachet as Tokaj Essencia, an elixir of such power, strength, and vitality that it was said to rejuvenate Hungarian kings on their deathbeds. Schiacchetrà was considered just such a rarity. One whiff of this bottle and the old rules and mysteries came gushing out. It had a bouquet of blossoms and honey, like a garden in July, bursting with myriad of scents, and yet with the weight of overwhelming tropical aromas and musk. It was unexpectedly lithe and graceful, not at all syrupy.